Organic vegetables | Our Farm by Earth Flora Inc.
Our flower farmers are going back to doing what they should be doing- growing their own food. The wisdom of their ancestors have been lost throughout the years to cup noodles and fastfood. They go on for days laboring and toiling, so they can buy food for their tables. They forgot that they were farmers- and as farmers, the soil would give them their bounty. Work done tilling the soil was not only for money to buy food, it was going to grow them the food itself. In the same way, we were living in the city, buying produce at exorbitant prices, when we could easily grow the same vegetables from our farm. Not only do we save on costs, we would know exactly what it was that went to our food. It took us awhile to change everyone’s mindsets. Most of them were quite happy eating cup noodles filled with no nutrition except salt and MSG. Their children were growing up with rice and noodle soup as their staple. We were lazy to go through the entire process of waiting for the vegetables, growing them, harvesting, and then only having the kind that was in season. Yet, the soil was rich and teeming with life, plants were growing in abundance, and the sun was shining. Imagine how much good nutrition they wasted, by mere forgetfulness (and of course, consumerism and media brainwashing.) 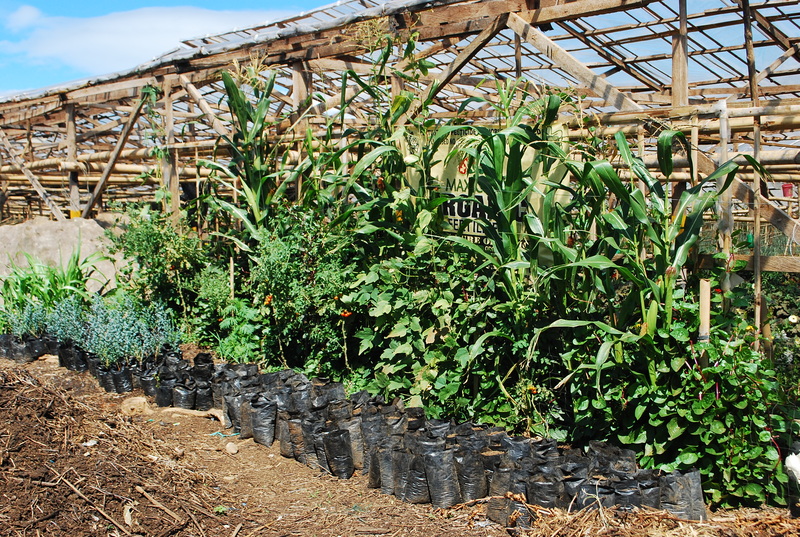 Since then, we have slowly reintroduced backyard farming to our farmers. There are now vegetable patches for employees to work on during their breaks. They could take the fresh produce home, put food on the table. The same patch will provide vegetables for the Steiner-inspired daycare we are building in the farm. Slowly, we are now growing some of the vegetables we eat. Our farm manager, a Bukidnon native, started gathering local and indigenous seeds growing in the area. He was able to discover Tahore, a local lentil, local sweet potatoes, native squash, native cherry tomatoes, edible flowers and native corn. We added a few more vegetables- carrots, 3 kinds of lettuce, okra, string beans, greenbeans, onions, edible flowers (ie. nasturtiums) and different kinds of herbs. Our flower farm has now a small vegetable patch, devoted to plants that do not only adorn our tables but we can eat as well! 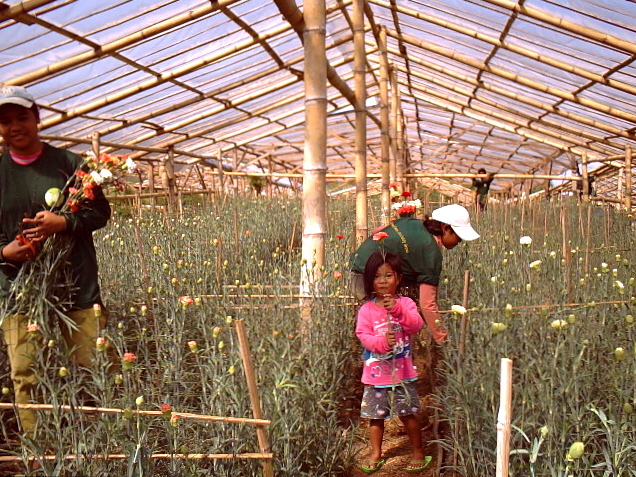 More than this, we have planted the vegetables to create patches of ecosystems for all nature in our farm. We do so by growing in all our vegetable beds, a mix of legumes, leaf plants, root crops, annual and perennial plants in one bed. Thus, legumes will provide nitrogen (fertilizer) through their roots. Root crops, taking nutrients from the soil, help aerate the beds, benefitting all plants. Herbs and flowers serve as homes for beneficial insects and also repel the harmful ones. As we wait for our vegetable and flower harvest, we look forward to real food, with all its vibrancy and nutrition. Our farmers will see the life forces of the food they eat, discovering new ways of providing for their needs and even experimenting with new cuisine. In time, they will not look for fast food or food that come in cans, plastic or boxes. As we harvest more and more vegetable, herbs and flowers from our patches, we look forward to little squash with green beans in a lentil soup.